Our unique Ellipse brass pet urn is a perfect choice for your beloved pet to rest. It has a unique oval design for ease of handling and comes with a fully fitted screw top to help with the loading process. Our Ellipse pet urn is available in both brushed gold (which features 2 small bronze paw prints on the lid) and brushed slate (which features 1 larger silver paw print on the lid) and are both available in sizes from 0.5 Litres (30 cubic inches) to 1.3 Litres (80 cubic inches). Please see our size chart for recommended urn sizes. 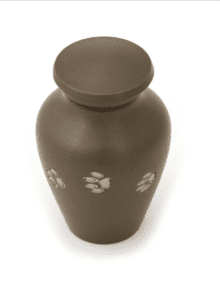 Our Ellipse pet urn comes with free delivery and returns and is covered by our satisfaction guarantee.